Scars of the gruesome ethnic conflict are still in their recovery stage. The implementation of the Post-war development plans, especially in the North and East, so far has been slow and hampered by external pressure. 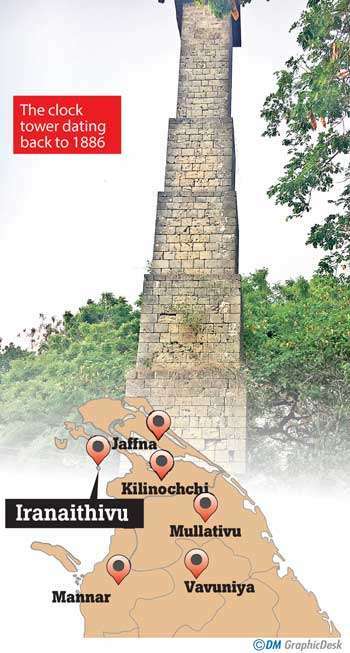 Among the many Internally Displaced Persons (IDPs) were 187 families from Iranaithivu, which comprises two islands belonging to the Pooneryn Division in the Kilinochchi District. Those displaced moved to Iranaimathaanagar, near Mulankavil in 1992 and eventually housed themselves in makeshift shelters. 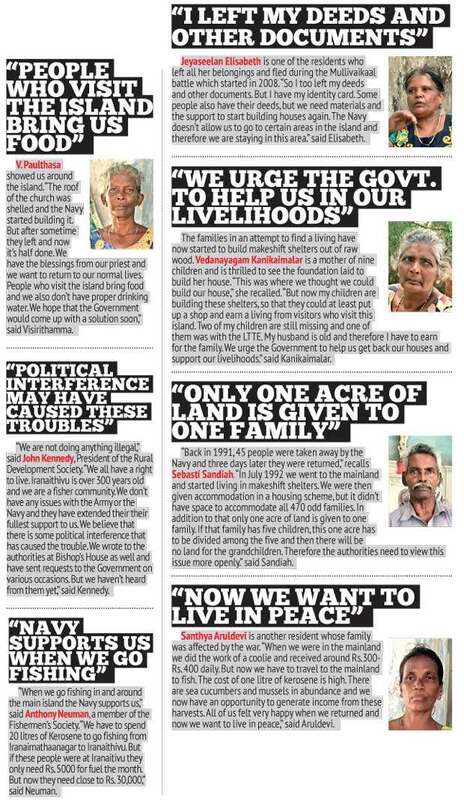 But last April these families decided to return to their homeland as their one year long protest to request the return of their lands fell on deaf ears. Upon their arrival, these Tamil families of the Catholic faith have begun to settle down, some with tears of joy, relishing how they once grew up there. But many of them don’t have their deeds and they require the support from the Government to stand up on their feet. On a recent visit to Iranaithivu, the explored this once prospering island and also spoke to its residents. Separated by a channel of sea water, Iranaithivu includes Perum Theevu (Big Island) and Sirum Theevu (Small Island), a beautiful island with ponds and crystal clear water. A 45-minute boat ride will take you to this long forgotten island of Perum Theevu in the North, standing out with its vast expanse of greenery – a clear sign of abandonment. Being a community that thrived on fishing, one could see them throwing their cast nets in search of fish several days after their return. Shelled and abandoned buildings, including a lighthouse dating back to 1886, makes one think of its long history. 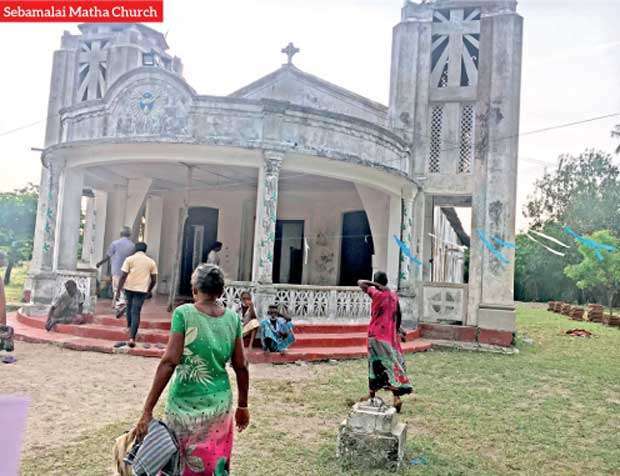 The main shelter at this island is the Sebamalai Matha Church (Roseiro Church) which has several statues of Mother Mary and Jesus, figures which have been there since the inception of this place of worship. With a school, hospital, three libraries, a church, a post office and the fishing centre this island was once equipped with all facilities. Today there are over 450 families waiting to start a new life on their homeland. Sea cucumbers and mussels could be found in abundance in the shallow waters around the main island and shore-based fishing practices provided an income for the women. The island’s waters are also rich in limestone making it a rich breeding ground for several marine species. The island also provides base material to construct houses, in the islands and the mainland. 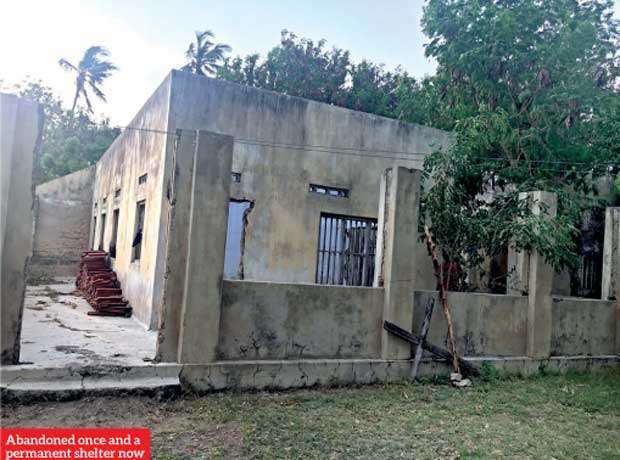 The main shelter at this island is the Sebamalai Matha Church (Roseiro Church) which has several statues of Mother Mary and Jesus, figures which have been there since the inception of this place of worship. With a school, hospital, three libraries, a church, a post office and the fishing centre this island was once equipped with all facilities. 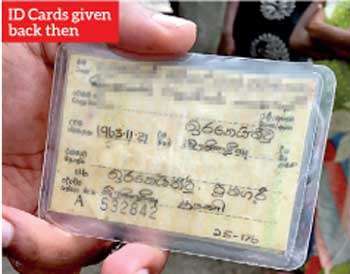 According to the statistics of the Ministry of Prison Reforms, Rehabilitation, Resettlement and Hindu Religious Affairs, as at October last year 44,119 families have been resettled in the Kilinochchi District. The remaining 729 families and 2395 persons living with friends and relatives in the same district are yet to be resettled. 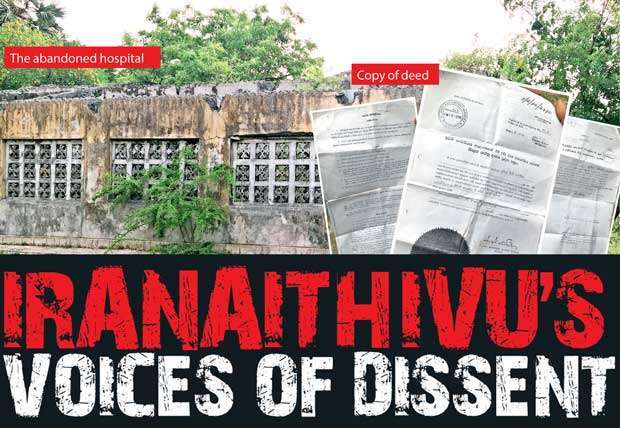 From 1992, the residents of Iranaithivu were displaced on several occasions, especially during the final phase of the war and they eventually left to Puthumathalan. As at now, people are allowed access to certain areas of the island. These people are still confined to one area in the island. However the once thriving fishing industry has faced many challenges especially with Indian and other local fishermen fishing in the waters. The other factor that stifles their industry is the wastage of fuel. Although numerous appeals were made to the Northern Province Chief Minister, the Prime Minister, the European Union Delegation in Sri Lanka and twice to the President himself in 2017, these challenges still exist. In May 2017, the residents staged a continuous protest in Iranaimathaanagar. These protesting voices were also heard in Pooneryn, Kilinochchi and even Colombo. As an outcome of these protests a series of discussions were held with community leaders and politicians, but the residents see no progress. Speaking to the , Ministry of Prison Reforms, Rehabilitation, Resettlement and Hindu Religious Affairs media secretary Dumidu Bandara said that several discussions were held with the military last year. “The Navy is planning to setup a radar system on this island as means of tracking illegal Indian fishermen. In that case people would not be allowed to remain in the area. However the Navy Commander also said that they are willing to take it down if the country doesn’t blame them in the event there is illegal fishing in Sri Lankan waters. The military has helped these people immensely and already around 40,000 acres of land have been released in the Northern Province. Discussions are currently going on to find alternative solutions for these people. These people prefer to go to their homelands, but with the war there have been certain transactions which the Government and the authorities are still trying to clear out,” he said. Upon visiting Iranaithivu, the learned that the church is the only place for these families to seek shelter. Every other building was shelled and has no roof. As such they have neatly arranged their belongings at a corner under a statue of Mother Mary. People are scattered all over the island and keep walking around to familiarise themselves back in their homeland. The Daily mirror learned that the Northern Province Chief Minister has to give permission to the land officers and commissioners to solve the prevailing land issues. However, several attempts to contact Northern Province Chief Minister C. V Wigneswaran proved futile.